We understand that it can be stressful to board your pet when you travel. Here at NOVA Pets, we ensure your pets are comfortable, safe, active, and that they receive the personal attention that they get at home. Saturday: 5:30 P.M. - 6 P.M.
Sunday: 5:30 P.M. - 6 P.M. So, how does boarding work? We require that each boarding guest is up-to-date on the vaccinations and tests mentioned below. 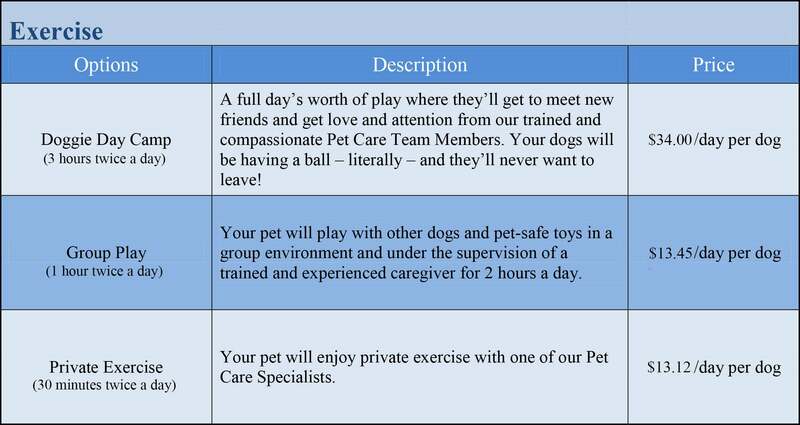 Since each pet has unique needs, we take pride in developing a meaningful bond with your pet in order to effectively cater to their individual requirements. All first time pet boarding guests will need to schedule a Meet & Greet so that you may see the facilities and meet with the doctor. We are proud to offer spacious atrium-style plexiglass suites for all dogs. When you drop off your dog, you will be required to fill out a boarding form to select your dogs room size and other amenities. Standard rooms range in size from 20-40 sq/ft and include a cozy bed and a minimum of three outside bathroom breaks per day. Window rooms range in size from 30-50 sq/ft and include a window, a cot with a cozy bed, and a minimum of three outside bathroom breaks per day. We also work with you for any special dietary needs your dog may have. Due to the daily cleaning requirements in our boarding facility, we ask that you do not bring your dog's personal items such as bedding and toys. NOVA Pets Boarding provides comfortable bedding for your dog as well as toys to keep them entertained during their time with us. Our feline-exclusive boarding condos and play area are located on a separate floor from the canine boarding suites. The cat condos are 10 sq/ft each with ample room to move around comfortably. Additional condo space is available if you would like to give your feline friend more stretching room. You may also choose play and grooming options as well. NOVA Pets prides itself on being an all-inclusive animal facility. We have available boarding options for birds, reptiles, small mammals, and other exotic animals! While we offer various housing options for all animals, we do recommend bringing your pets personal travel enclosures to keep them more comfortable while in our care. Psittacosis is a contagious avian infection. Since Psittacosis is transmissible from birds to humans, NOVA Pets requires proof of a negative Psittacosis test prior to boarding. NOVA Pets Health Center strives to be an example in the care, comfort, and cleanliness throughout our facility. Thinking about boarding your pet in the near future? Make an appointment to tour our facility with one of our care specialists. During this time they can answer any questions that you may have. We understand that traveling can be stressful so we work with our clients to ensure complete ease of mind when it comes to your pets. If you have any questions about our boarding services, please give us a call at (703) 378-9791 or make a reservation through our website today. You may also make reservations through the PetDesk Application that you can download onto your phone for your convenience. Please, click here for our boarding and day camp policies.